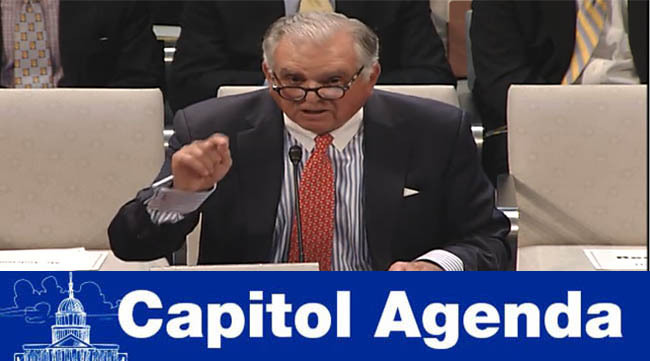 With the Senate Commerce panel set to take its first step in the 116th Congress to address freight infrastructure needs, it’s worth reviewing the advice Ray LaHood offered last week to the transportation committee in the House. Step 1: Come to grips with the reality that a sustainable source of money is needed to ensure funding for the construction and maintenance of infrastructure programs. Then, consider supporting at least a 10-cent fuel tax increase indexed to inflation. If there’s agreement for a 25-cent increase, as President Donald Trump is said to have suggested last year, then “hooray,” LaHood said. “Think of it as a jobs bill.” The legislation also must prioritize safety. Feb. 12, 10 a.m.: The House Science, Space and Technology Committee hosts a hearing titled, “The State of Climate Science and Why it Matters.” Witnesses will include Natalie Mahowald, engineering professor and faculty director for the environment at the Cornell University Atkinson Center for a Sustainable Future; Robert Kopp, director of the Rutgers Institute of Earth, Ocean and Atmospheric Sciences and professor at Rutgers University’s Department of Earth and Planetary Sciences; Jennifer Francis, senior scientist at the Woods Hole Research Center; Joseph Majkut, director of climate policy at the Niskanen Center; and Kristie Ebi, public health sciences professor and director of the University of Washington’s Center for Health and the Global Environment. Feb. 13, 10 a.m.: Not to be outdone by their House counterparts, the Senate Commerce Committee intends to dive right into infrastructure matters with the heads of the country’s top freight associations. The committee’s leadership expressed an interest in determining immediate infrastructure needs to be able to, as they indicated, “keeping pace with a growing economy.” Look out for the partisan dynamics during the hearing, since the Green New Deal co-author and several 2020 presidential aspirants will press the witnesses on their views. Witnesses will include William Friedman, chairman of the American Association of Port Authorities; Ian Jefferies, president of the Association of American Railroads; Matthew Polka, president of the American Cable Association; Chris Spear, president of American Trucking Associations; and Larry Willis, president of the Transportation Trades Department. Feb. 12, 10 a.m.: The Energy and Mineral Resources Subcommittee hosts a hearing on climate change. Feb. 12, 10 a.m.: The Information Technology and Innovation Foundation hosts a panel discussion titled, “Moving America: How Policymakers Can Accelerate Automation in Freight Transportation.” Speakers will include Adrian Arnakis, senior vice president of government affairs at the Association of American Railroads; Thomas Jensen, senior vice president of transportation policy at UPS Inc.; and Suzanne Murtha, national lead for connected and automated technologies at AECOM. Feb. 13, 8 a.m.: Axios hosts a panel discussion about technology and infrastructure featuring Sen. John Thune (R-S.D.) , Rep. Yvette Clarke (D-N.Y.), Mayor Andy Berke of Chattanooga, Tenn., and Gary Shapiro, president of the Consumer Technology Association. Feb. 13, 10 a.m.: The National Parks, Forests, and Public Lands Subcommittee hosts a hearing on climate change. Feb. 14-16: The Democratic National Committee scheduled its winter meeting. A lively debate during a House hearing Feb. 7 meant to kickoff infrastructure talks on Capitol Hill potentially inspired policymakers to focus up on advancing a long-term measure this year. Green New Deal? Bill Scher is not impressed. Shoshana Lew’s meteoric rise in the transportation community reached a high note earlier this month after the Colorado Senate gave unanimous approval to her nomination to lead the state’s Department of Transportation. Lew put in almost two years as Rhode Island’s DOT chief operating officer, and before that she was chief financial officer and assistant secretary for budget and programs at U.S. DOT, during the Obama administration. She began her career as an analyst at the Brookings Institution’s Metropolitan Policy Program. We’ll soon learn the ranking of the country’s worst freight bottlenecks. A key annual report will be unveiled shortly. New World Order: Art imitating life. Very excited to be joining Brookings Institution as a Nonresident Senior Fellow. This country really needs a good, robust infrastructure conversation, and @BrookingsInst is a great partner. You asked me the question, ‘Is a shutdown entirely off the table?’ The answer is no. Acting White House Chief of Staff Mick Mulvaney on Feb. 10 on Meet The Press.